A couple of weeks ago I was listening to an episode of Radiolab on which they shared an episode of the short podcast series Unerased titled: Dr Davison and the Gay Cure. They were talking about the former perception of homosexuality as a disorder and the rise of conversion therapy. As I was listening what they were saying really struck a chord with me. I found myself thinking “this is exactly how people are going to think about weight loss counselling one day”. This belief in relation to homosexuality was considered to be fringe and most people weren’t in support of it initially. This parallels the Health at Every Size/body diversity/weight acceptance movement. There is a lot of push-back from people in the medical community and the general public when it’s suggested that weight is not a condition that needs to be treated. Just as with the acceptance of homosexuality as a normal state, there were a few outspoken pioneers leading the movement and with time, it became more accepted by the mainstream. I feel that this is beginning to happen now with weight. More of us RDs who were always taught that “overweight” and “obesity” are unhealthy are coming to realize that people can be healthy at many different sizes. Of course, there are still hold-outs and there is still conversion therapy happening in some places. Similarly, there will likely continue to be hold-outs who believe that only thin people can be healthy and that BMI is indicative of health. However, I’m hopeful that we’re reaching a turning point and that one day the medical community will agree that weight is not a “problem” and that weight loss treatments are unethical. Tags: body acceptance, body diversity, body positivity, diet, ethics, fat, HAES, health, health at every size, obesity, Radiolab, Rd, Unerased, weight, weight loss, weight management | Permalink. I would like to propose that we stop demonizing calories. All too often I see products promoted as “low-calorie” or “calorie-free”. I hear jokes about things like it’s okay to eat a broken cookie because the calories all leak out. Consuming as few calories as possible is considered virtuous. This despite the fact that we need calories to live. Just in case you need a quick refresher on calories, despite what many people will have you believe, a calorie is a calorie. The definition of a calorie is, “the heat energy required to raise the temperature of one kilogram (rather than a gram) of water by one degree Celsius”. Calories provide us with energy. Energy to get through each day but also energy for your body’s systems and cells to function. Without a source of calories you will die. So, why do we think that calories are bad and something to avoid? Because we’ve learned that excess calories, those we don’t use up, are often stored by our bodies for later use in the form of fat. And fat is bad because our society has rather arbitrarily decided that being thin is more attractive. Regardless of your body shape or size though your body still needs calories to function. Wouldn’t it be wonderful if we lived in a world and mental space where instead of choosing 100 calorie snacks or avoiding foods because they contain “too many calories” we could look at food as a pleasurable way to nourish our bodies? Not just to think of food as fuel but as an essential component of self-care. Calories are not the enemy, they are vital to life. Tags: calorie, calories, diet, energy, health, healthy eating, nutrition | Permalink. 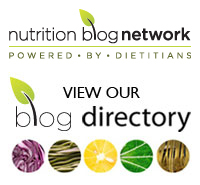 Do dietitians follow the Food Guide? Obviously, this is a completely unscientific poll but it does show that the majority (83%) of RDs who responded do not generally follow the dietary guidelines for their respective counties. This could be for any number of reasons. Most didn’t respond with a reason. Those who did said that they weren’t big on fruit of dairy or the carbs (that’s the grains food group) are too high. Personally, I suspect that some days I’m low in vegetable and fruit consumption or milk and alternatives. Other days I’m definitely over. And if I’m being completely honest, I have something from that “other” food group (aka sometimes foods) on the daily. The truth is, the Food Guide is just a guide. It’s not a bible. It’s intended to provide people with all of the nutrients and energy they need to be healthy and active but everybody is different. We all have different needs and preferences. I know that people really like to rag on dietitians and say that all we do is preach the food guide but I’m here to rain on that parade. Dietitians are people too and we enjoy food for more reasons than just as fuel. We are not robots that run on kale and quinoa. I think that most of us think that the food guide could be improved (and fingers crossed it will be whenever they finally come out with the new version) but we also know that it’s just meant to be a tool. Food Guides are meant to guide people toward nutritious food choices. They encourage a variety of foods from all of the food groups. The overall message that people should be taking from a food guide is that there are healthy choices in all the food groups and eliminating any one food group may result in deficiencies. Also, that eating only one type of food from each food group (e.g. lettuce as your only veg or bread as your only grain) is not going to provide you with all of the nutrients that you need. However, it’s also important to listen to your own body and nourish it accordingly. If you’re not hungry don’t sweat the fact that you’ve only had 5 servings of vegetables or 4 servings of grains. Conversely, if you’re extra hungry one day, don’t feel like you have to limit yourself to the servings recommended in the Food Guide. Healthy eating really doesn’t have to be complicated or rigid. In fact, if you think that you’re eating healthily and you’re finding that it is complicated or rigid then you diet (or relationship with food) probably isn’t all that healthy after all. Tags: Canada's Food Guide, diet, dietary guidelines, dietitian, food guide, healthy eating, nutrition, Rd, what RDs eat | Permalink. I feel like there’s one thing missing from a lot of the discussion about the keto diet (and similar extreme diets, really). Everyone talks a lot about whether or not it “works” with proponents on both sides, research supporting both sides, arguing that it does or doesn’t work for weight loss. The problem with this is the assumption that weight loss is the most important feature of a good diet. It’s not. You can lose weight eating lots of things that are not going to provide you with the nutrients you need. Weight loss is not the most important thing for health, despite what the media, the “wellness” industry, society, and even many health care professionals have lead us to believe. Just because you feel good on a ketogenic diet and are losing weight doesn’t mean that it’s a good idea. As a dietitian, this is something that I really struggle with. It’s our job to support people. We can tell them that keto is a difficult diet to follow, that it may not be advisable, but when it comes down to it, they decide if it’s something they want to pursue or not. And if they do decide to pursue it, we can’t say “well, good luck, I wash my hands of you”. We have to help them undertake it in as healthy a way as possible. Which kind of blows my mind (and makes me glad that I don’t work in a counselling role) because if someone came to us with an eating disorder we wouldn’t support them in that. How can it be ethical for us to support people in following a diet that may cause them harm? A little history of keto: the ketogenic diet originated as a treatment for epilepsy in children in the 1920s. It was intended to mimic the effects of fasting through the generation of ketones. In recent years this concept has caught on with people desiring to lose weight. After all, if ketones are produced during fasting, then if a specific diet can promote the production of ketones, it may also lead to weight loss. Not illogical. In some children with epilepsy who do not experience a reduction in seizures with medications, the ketogenic diet can be an effective treatment. However, there are potential side-effects. A few long-term studies (1, 2) have looked at the effects of the ketogenic diet in children and have found such side-effects as: kidney stones, slowed growth, dyslipidemia, and fractures. There are also short-term risks (2, 3, 4) associated with the diet in children with epilepsy including: acidosis, hypoglycemia, gastrointestinal distress (including vomiting, constipation, diarrhoea, and abdominal pain) dehydration, hypoproteinemia, and lethargy. All of these studies have found low long-term adherence among children. There are many reasons for this: some children see improvement in symptoms, even after discontinuing the diet, others find it difficult to adhere to the diet, for some it’s not effective. Of course, adults who wish to lose weight are not the same as children who have epilepsy. It’s hard to say if slowed growth in children would have a similar counterpart in an adult. However, many of the short-term side effects may be seen in adults, as may some of the other long-term side effects. In addition, there is potential for nutrient deficiencies when following such a restricted diet. Unfortunately, we don’t have research into the long-term effects of a ketogenic diet on adults using it for weight loss. We have some short-term studies that primarily look at it from the standpoint of whether or not it’s an effective weight loss diet. Maybe it’s perfectly safe, but maybe it’s not. Given that the vast majority of people who lose weight on the diet end up regaining it, and often more, is it really worth taking that risk? By following a keto diet you’re basically enrolling yourself in an uncontrolled experiment. I think it would be interesting to know what the long-term effects of a ketogenic diet for weight loss are in adults. What I’d really like to know though is why we have become so obsessed with being thin that we are willing to adopt disordered eating habits at the expense of other aspects of our health and well-being. Why is it when we talk about a diet “working” we de facto mean weight loss? Why have we come to value weight loss over every other indicator of health? Why can’t we just value ourselves enough to properly nourish our bodies? Tags: diet, epilepsy, health, keto, ketogenic diet, ketosis, nutrition, weight loss, well-being, wellness | Permalink.